Anne Fifield, Economic Development Manager with the City of Eugene, says to find a good example of Smart Growth principles in practice, look to the Friendly Street Neighborhood in Eugene. “There’s a little node of activity,” she says of the area, anchored by The Friendly Street Market, near the intersection of 28th and Friendly. “There’s more goods and services for people to walk to that have organically popped up,” she adds. Friendly Street Market on 2757 Friendly St. is one example of a service hub in a neighborhood experiencing smart growth. But Smart Growth means different things to different people. “It’s not compact growth for compact growth’s sake,” Fifield explains. “It’s walkable,” she says. “It’s bike-able.” People in Smart Communities have multiple modes of transportation, she continues. And Smart Growth or compact development isn’t just about density, Fifield says. It’s about making sure development pays for itself in the long term. It’s about looking at planning and development so that it’s both fiscally sustainable and serves a purpose for the community. Smart Development, she clarifies, needs to pay for itself in the long term. “Roads are considered assets,” she goes on, but they’re really liabilities. “Smart growth is a lot more likely to provide enough tax revenue,” Fifield continues, for infrastructure upkeep. “It positively impacts property tax revenue, which helps to pay for cops and for fire,” she says. In addition, Smart Growth is about design: how to access goods and services without being auto-dependent, Fifield adds. Overall, she feels principles of Smart Growth are important for the future of Eugene and Lane County’s expanding economy. Smart Growth supports Eugene’s high quality of life, she says, which is a selling factor to many businesses looking to relocate to the area, or local entrepreneurs looking to start and keep their business local. 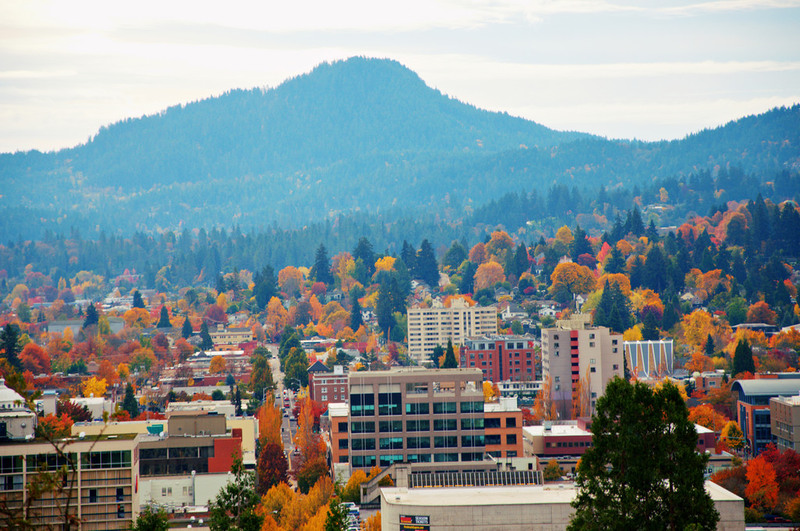 Oregon has the reputation of being a nice place to live,” she comments. And Fifield feels RAIN Eugene provides value for stakeholders interested in seeing Eugene grow and prosper along these principles. RAIN Eugene, she says, connects startups to valuable resources, helping Eugene become an entrepreneurial community. Joe Maruschak agrees. Maruschak is Executive Director at RAIN Eugene. And when it comes to Smart Growth, Maruschak puts the definitions aside. “To me, Smart Growth is a fully integrated approach to growing a community,” he explains. RAIN Eugene’s focus, Maruschak continues, is on economic development as a component of this kind of growth. “How do we make sure the wealth is being spent on the benefit of the community,” he says. Jobs actually come from small businesses, he continues. Dig deeper, he says, and you find it’s not just small companies, it’s young, growing, companies that really fill the economy. And it’s these startups, often founded by Millenials, that value that kind of lifestyle afforded by Smart Growth. “Younger adults have been living in compact environments,” Fifield responds. “They came on the market during a recession,” she says. This affects their ability to buy a home, which delays suburbanization. And If we want to retain these businesses in Eugene, they need access to raw resources, Maruschak explains. “They need money,” he adds. “They need infrastructure.” And they need a workforce. “Companies can’t grow here if there are not enough people to work,” he notes. Workforce issues are common in growing economies, and Maruschak says Eugene’s economy is definitely growing, with new jobs opening up all the time. Networking and educational services provided by RAIN Eugene are helping to address this issue. For example, RAIN Eugene’s event Experience Oregon Tech helped expose high school students to the opportunities existing in their own town. Keeping them here instead of losing them to Portland or Seattle, Maruschak adds. “Thinking very young, very long term,” he says. In the end, Maruschak says RAIN Eugene would rather support Smart Growth priorities not by attracting an out-of-the-area employer to create two-thousand jobs. Instead, he says RAIN Eugene would rather support 100 local companies that will create 20 jobs. “I don’t think that’s a really good approach to repeat,” he adds. That’s what we saw in the steel industry and the auto industry, he points out. As well as the timber industry. “When you become overly dependent on one kind of industry everyone is at risk,” he says. It’s better, Maruschak says, to grow your own.